PHILADELPHIA — The Board of Education has selected two non-voting Student Representatives who will serve in an advisory capacity to represent the interests of students in Philadelphia. 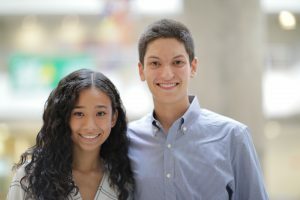 The selected students are Alfredo Praticò, a senior at Masterman High School and Julia Frank, a senior at Northeast High School. “We have been anxiously awaiting this huge opportunity to bring student voice into our work. After meeting Julia and Alfredo we could not be more excited. These are two exceptional Philadelphia students who are going to be instrumental in expanding the reach and thinking of the Board,” said Board President Joyce Wilkerson, who will act as a mentor to the students. A total of 54 students applied to this opportunity from across Philadelphia. Students went through an extensive interview process by a selection committee of diverse stakeholders made up of students and adults from The Mayor’s Office of Education, Mayor’s Office of Youth Engagement, Charter Schools Office, Office of Student Support Services, the Superintendent’s Office and Student Advisory Board, The Philadelphia Youth Commission, Urbed, and City-wide Student Government. The Board decided to have two Student Board Representatives in order to reflect the collaborative nature of board work. The students will alternate their participation at Action Meetings, and they will work together to engage and communicate with their peers. Both Alfredo and Julia will be honored with an Installation Ceremony during the September 20 Action Meeting. Get to know more about the new Student Board Representatives by visiting the Board of Education website. The Board of Education is the governing body responsible for overseeing all policies and budgetary decisions of the School District of Philadelphia. Additionally, the Board of Education serves as the authorizer for all charter schools in Philadelphia. The Board is made up of nine Board Members who are appointed by the Mayor.